I have a Facebook account, but I almost never post. I also have a Linkedin account, but it is a not premium, largely because I am not that interested in finding out who is looking at my profile or endorsing me (often for skills I don't have). I do have a Twitter account and while I don’t post very often, I just like the ease with which it lets me bug thousands of people. All of this is of course a lead in to the story that I am sure will dominate the financial news for the next few weeks: Twitter is planning its initial public offering and everyone has an opinion on what it will be priced at. While I will try to value Twitter when the time is right, I am going to use this post to price Twitter, not value it, for three reasons. First, Twitter’s financial statements are still inaccessible, a consequence of the JOBS Act (passed last year) that allows “emerging companies” (with revenues < $1 billion) to use a confidential process for filing with the SEC. Unlike some who are worked up about the resulting lack of transparency, I am not in high dudgeon about this non-disclosure. The company will have to provide a full prospectus a few weeks before the shares are priced (and offered) and there will be plenty of time for me to do my due diligence. Second, the lead investment bank (Goldman Sachs) will be pricing the company for the offering, not valuing it, and I want to use this post to take a look at that process. Third, if you choose to play this IPO game, to win, you have to be able to play the pricing game well, not get the value right. 1. Current price: This may sound circular but the key input into the pricing process is the current price of the asset. After all, in pricing, you are accepting the market’s judgment of price as the only number that ultimately matters. With publicly traded companies, this dependence on the price takes the form of charts and technical indicators, which can then be mined for clues about future price movements. Looking at a still private company like Twitter, this approach may seem like a non-starter, since it has no public market, but there have been transactions in the past that provide clues about its price. Some of these transactions involve venture capital investments, where you can extrapolate from the investment and the share of the company received by the venture capitalist to the overall price of the company is. Others involve private sales by one investor to another, where again the transaction price provides clues as to the the overall price. The following graph, drawn mostly from a Wall Street Journal news story on the company, imputes prices for Twitter based upon trades over the last few years on the company’s equity. Note that the imputed price of equity in Twitter was $100 million in 2008 and that the price has surged over the last three years, rising from $ 1 billion in late 2009 to $ 9 billion early this year and $10.5 billion a week ago. Much of the surge occurred in the latter half of 2011, after Linkedin went public to a rapturous market response in May of that year. Is it okay to extrapolate from isolated transactions to overall price? Yes and no. There is information in the transactions but the price estimate can be skewed by three factors. The first is that the transactions may not be at arms length, resulting in a price that has less to do with what the transactors think the business is worth to them and more to do with side objectives (control, taxes). The second is that even in an arms length transaction, the value that you impute may not be reflective of the fair price for a publicly traded company but may reflect instead the pricing of a private, illiquid business (which is lower). The third is unless the most recent transactions occurred very recently, the price you get is stale and will have to get updated to reflect both market and sector developments. With Twitter, none of these concerns rise to a serious level: the venture capital transactions are motivated by profit, the company has been priced as company that will go public for the last two or three years and there are at least two recent transactions from this year. The first reflects the sale of 15% of the company to Blackrock, with an imputed price of $9 billion for the company. That transaction was in January 2013 and both the market and social media companies have risen in price, since then; the S&P 500 is up 20% since January and Facebook & Linkedin, the two social media companies that are viewed as closest to Twitter, have gone up even more over the same time period (Linkedin has doubled and Facebook has gone up about 67%). Applying even the market change (20%) to Twitter would yield a value of $10.8 billion, and applying the social media appreciation number would increase that value to $16-$18 billion. In September 2013, just a few days ago, Twitter bought MoPub, a mobile advertising exchange, and issued stock to cover the transaction cost. 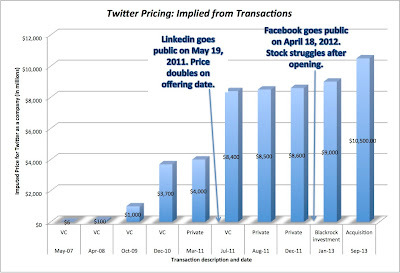 Imputing the value of Twitter from the share issue leads to an imputed price for Twitter estimate of at least $10.5 billion. Thus, just based on these two private transactions, the price of Twitter should be at least $10.5 billion and perhaps a bit more. 2. Relative value: The other commonly used tool in pricing is relative value, where you set the price for an asset by looking at the prices at which comparable companies are traded at in the market. The process of applying this approach to price a company like Twitter can be complicated by two factors. All the normal caveats apply. The accounting numbers reflect trailing 12 month estimates, but in companies like these, these numbers will change dramatically from period to periods, as will the number of users and employees. The number of users disguises wide differences among them, with heavy, mild and completely idle users aggregated together and sometimes double or triple counted. The value per users will be skewed by differences in business models, with companies like Netflix that have subscription based revenues registering much higher values. Before you get too excited about this convergence, recognize that applying the median EV/Sales ratio of 8.67 for the social media medley to Twitter's revenues yields a value of $5.05 billion, making the $10 billion plus numbers being bandied about look awfully high. 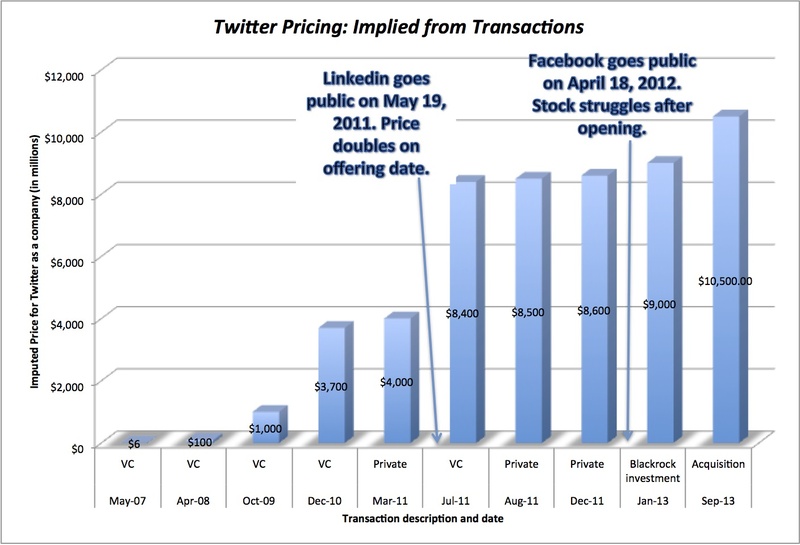 Just to round out the estimates, you could always apply the multiple of $130.32/user that investors are paying collectively for Linkedin and Facebook to Twitter's 240 million users (I have seen wildly varying estimates of this number with some estimates ranging up to 500 million) yields a price of close to $25 billion. Which one of these is the right price? That depends on what your priors are about Twitter and perhaps what you are trying to convince me to do. If you believe that it is a great company that will also be a great investment, you will go with the combinations that yield the higher number. If you are convinced that this is the next bubble that will burst, you will use the lowest values to justify selling short or warning people away from the company. It is no wonder that equity salespeople latch on to this approach. All you have to do is find the right mix of multiple and comparable firms and you can back up any sales pitch (that the company is cheap, expensive or correctly priced) you want to make about any company. If you are on the other side of this sales pitch, it has be caveat emptor. b. Current versus Forward Numbers: To the extent that your multiples are skewed or meaningless because current values for earnings, book value and capital expenditures are small and meaningless (in terms of forecasting future values), you can try to forecast the values for each of these items and apply a multiple (based usually on what other publicly traded companies are trading for today) to get the estimated value in the future. Getting from that future value to value today can be dicey, as I illustrated in my last post on Tesla, as risk, time value and dilution all eat into the terminal value. It is also worth noting that while this may be easy to do for a young growth company in a sector where most of the competitors are mature, it will be difficult to do with Twitter, where the lead competitors, Facebook and Linkedin, are also in high growth and will change over time. Momentum/Mood: Much as intrinsic value investors tend to disdain momentum, it remains true that momentum is one of the most powerful forces driving returns with stocks. Studies indicate that over shorter time periods, momentum based investing often delivers much better results than fundamental based investing. For some stocks, especially those in "hot' sectors, momentum is the key driver of prices, drowning out news about the fundamentals. Incremental news: Once you accept the pricing proposition that the market price is what it is, the key to winning at the pricing game becomes forecasting changes in price rather than assessing whether the current price is right. As a consequence, your focus on news stories will become incremental and each news story will be assessed in terms of how it will change the price, rather than how it will affect overall value. Liquidity: If you invest based on long term value, you can afford to put liquidity on the back burner for two reasons. First, the cost of illiquidity (higher transactions costs) can be spread over your long holding period, reducing its impact on your returns. Second, since you are not investing on momentum and not as dependent on timely trades for your profits, you can afford to wait to buy or sell, rather than have to do so in the middle of market chaos. If you are trying to make money on pricing, liquidity or the lack of it can not only make the difference between making and losing money, but in extreme cases, can lead to disaster (especially if you have a pricing strategy accompanied with high high leverage). Markets can be wrong in the aggregate: I know that active investors view those who believe that markets are efficient (I don’t…) as eggheads or worse. It is worth noting, though, that many of these same active investors are “pricers”, who pick stocks based upon multiples and comparable firms. In effect, they are assuming that markets are right in the aggregate, but make mistakes on individual companies, which would make them semi-believers in market efficiency. If markets are wrong in the aggregate, you can be right in your relative assessment (that a stock looks cheap relative to its competitors) and still lose large amounts (if they are all over priced). Mood shifts (inflection points): To the extent that price is driven by momentum and mood, shifts in that mood can very quickly turn profits to losses. The key to winning at the game therefore becomes detecting inflection points (where positive momentum turns to negative momentum) and altering your investment strategy. This is the promise of charting and technical analysis, where price and volume patterns yield clues about future momentum shifts. Even the best indicators, though, often fail at this task. It is also worth noting that momentum is fragile and based partly on illusions. If bankers show contempt for the process and its players (as I think Facebook and its bankers did at the time of their IPO), the momentum may very well shift. Taxes and transactions costs: As a general proposition, playing the pricing game requires you to have a shorter time horizon and to trade without regard to tax consequences. Thus, if you buy a momentum stock and profit over the ten months that you hold it but you detect a shift in momentum, you will sell the stock and take your profits, even though you face a much tax bill as a US investor (if you had held for a year, you could have qualified for capital gains). If you decide to play the pricing game, you will have lots of company. In fact, I would argue that much of what passes for valuation in investing is pricing. In an IPO, in particular, how a company is priced for a public offering and what happens in the after market, at least in the months following the offering has more to do with pricing than value. Am I being cynical? Perhaps, but I think we would all be better served if the process was stripped off its veneer of value. If we honestly faced up to the reality that this is an exercise in pricing and not valuation, the bankers can dispense with their quasi DCF models that they have no belief in, focus on pricing the stock and recognize that they will be judged on their pricing and deal making skills, not their valuation expertise. The issuing companies will recognize that their role in the process is to act as facilitators in the marketing, packaging the company like a shiny present and providing incremental news that pushes the price in the right direction. The investors who decide to play the IPO game or invest in the after market will not waste their time and resources estimating value, since their success or failure will come from how well they gauge momentum shifts and time their exits. I will value Twitter, when the financials are released and the time is right, but my advice to you is that you ignore my valuation, if you are playing the IPO game. The market for Twitter will little note nor long be concerned with my or anyone else’s assessment of value. Great Post! But I am finding it hard to differentiate between relative valuation and pricing. Especially in the case of twitter. Seems like the two concepts are synonyms. Kindly do explain. YES! I'm sure many have been waiting for you to post this. Thank you! Do you think Twitter will also have a dual share class structure similar to the other social media companies? Nice. Now we wait on the data. I'm using a weird way to value these high growth plays. I work with a 6.5% market real return expectation as a reasonable buy point for a long term investor. Now if I am comfortable with a market earnings growth rate of 3% in the very long term, and I expect the stock to deliver a growth premium of 3.4% over the macro rate, I use 3.1% as my discount rate to arrive at a reasonable price to buy for the stock. I do adjust the discount rate for beta, though to my surprise I have found several of these stocks work with low betas. I apply the discount rate to an adjusted Gordons growth model which works with estimated distributable earnings based on how much needs to be reinvested to generate the target growth rate based on LT RoE expectations. Many model weaknesses but it gets me to a rough entry price. And then for a bear price I eliminate the growth premium reduction to the discount rate. An excellent post, given interesting views on what will happen! Pricing is the approach and relative valuation is a tool (and not the only one) used in the approach. (Intrinsic valuation is the approach and DCF valuation is a tool (and not the only one) used to estimate intrinsic value. I think it can be classified with what you call the more cynical approach. Read your post and loved it. You are even more cynical than I.
Valuation on cruise-control must be possible. Ever since my first contact with you, Prof (a few months back) and early in the morn when the birds are still asleep, I've put in an hour here and there to get through valuing ~ 60 companies using your spreadsheet. However, now I want to go beyond plug and paste and get into the guts and furthermore, lazy beast that I am, want to do have this done for me automatically. Any pointers on this one, Prof ? Thank you as always. Great post professor -- nice to learn about some inventive, if not particularly useful pricing metrics. The user multiples were particularly interesting. I've been reading your blog for a few years and was happy to see The Epicurean Dealmaker post here. Him and Matt Levine -- who actually linked me over to this post -- are among the best of financial news bloggers/writers. This is a very interesting post and read. I have often struggled with the difference between value and price...partly because during my banking days the two were often conflated. Which leads me to my question - Professor, in your opinion do the investment bankers setting the 'price' of the stock appreciate the distinction between price and value? I know that I didn't when I was in investment banking. I truly believed the process you described above was 'valuation'. Anyone else with input? Investment bankers never think about value. For them it is price first and then backing that up with range of values from DCF and comparables. This is only to cover their a*. They are only bothered about how to pitch their case and earn fees. As a firm they are after fees and as individuals they are after bonus. They are the most unethical lot I have seen. After them come auditors who are willing to sign off the financial statements for fees. I think you are being far harder on banks than I would be. Just as I would not blame my realtor for selling me a house in 2007 for a price that was way too high in hindsight, I don't have an issue with what bankers do, which is sell. Just as you have to watch out for your interests when you walk into an electronics store and not trust the sales person to sell you the TV that is right for you, you have to watch out for your interests when your banker tries to tell you that Twitter is cheap at $12 billion. It is a point that I try to make repeatedly to the analysts and associates entering banks but I think it falls on deaf ears. Much of what passes for valuation in investment banking and portfolio management is pricing. I just wish that they were more honest and open about it. It would save us all a ton of time, trouble and aggravation. There is nothing wrong with automating the parts of valuation that bore you but that should release you to spend more time on the parts of valuation where you require imagination and creativity - coming up with a narrative for the company that is economically sustainable. Keep at it, though! It will come. I can't believe the hype that is building up. Is Twitter really worth what people say it will be? The IPO will be really interesting. Dear Prof, I agree with you that I was quite harsh on banks, and that the caveat emptor is on the buyer rather than on the seller. And of course, not all are that bad. However, not all buyers are smart enough, especially, those small individuals, who jump at rosy pitches. Here, the first to be blamed is the buyer, of course. Nevertheless, there is some moral responsibility on the sellers and their reps to be honest and transparent. I have observed both banks and auditors closely and how they function. What banks should consider (and they don't) is that - if they were to recommend the stock to their favorite person in the world, would they do it, or would they invest (not speculate) their own personal money in it? Most occasions, the answer is no. I wouldn't sell something just because some idiot is willing to buy at my quote. Money is to be made alright, but through the right process, I guess. It is a harsh reality; but then again, if the buyer is not willing to be smarter, the blame is on him/her. I wish someday these banks and audit firms become a little more considerate about their moral obligations towards the investors. Great post Professor! I will for sure be watching Twitter to see what happens, great to see your prediction. Professor, thank you for your comment - it's very insightful. I can tell you from my experience in investment banking that I was confused most of the time. Even though I could quickly skim through financials, select the "right" relative valuation multiples, build complex DCF models (reverse engineered of course), and justify my analysis under rigorous scrutiny, when it came to actually believing in the "valuation" recommendations I was giving, things fell apart for me. It just didn't feel right and I couldn't develop a consistent framework for thinking about valuation and equity analysis. This, partly, could have been due to my own lack of experience at the time. But I also believe it has to do with the fact that I didn't appreciate that the function I was fulfilling was "pricing" and not "valuation". To the extent that I ever considered the distinction, I convinced myself that it was "too academic" for the "real world" -- how wrong I was. To sum things up, your comment that the pricing vs. valuation distinction "falls on deaf ears" is absolutely accurate - my experience is just another example of which you have many, I'm sure. Thanks again for your valued insights. It is quite simple if a product is high in demand then it is obvious that it is costly.So what's the bid deal? This was really so very interesting and fun for me to play. I have enjoyed playing this game much. This was great. I was wondering why you did not use Baidu Inc. as a possible comparable for Twitter or Facebook? Do you think it could make sense to do so or not? When you talk about pricing the company based on the last two transactions - growth in the social media sector and growth in the S&P 500... could we instead use the CAPM model and incorporate both of these factors to get an expected return? The Beta being the sectoral Beta in the Social Media space? I appreciate you and I would like to read your next post. Thanks for sharing this useful information. when you start a business then at first you need every business related news. we find a real news that help for your business.